Come celebrate the Year of the Pig! 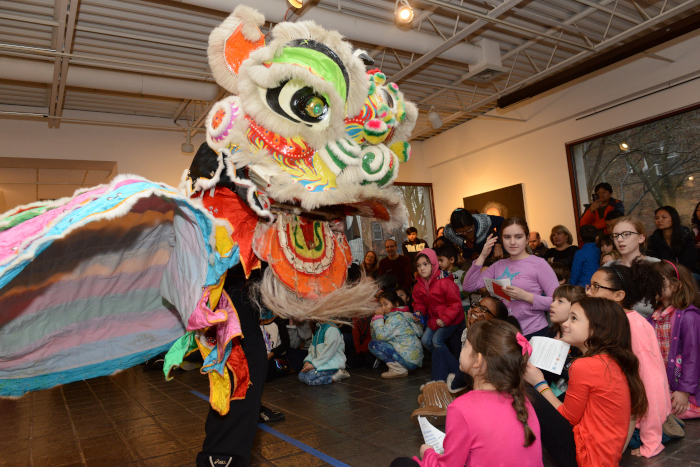 Chinese New Year returns to Pelham Art Center on Sunday, February 10, 2019 with free, family-friendly activities. Come see the wild Lion Dance that clears the air for a fantastic new year. There will also be two hands-on art-making workshops for everyone to enjoy! From 1:30-2:30 pm, members of Kwan’s Kung Fu will perform a traditional Lion Dance, believed in Chinese culture to scare away evil spirits and to bring good luck. This is always a favorite with the kids! The Lion Dance program includes an educational and historical introduction to the dance and an interactive performance, followed by a question and answer period. During the performance the giant lion, led by drum rhythms, makes its way around the room interacting with the crowd. Children can feed the lion red envelopes filled with written wishes for good luck in the New Year. Kwan’s Kung Fu has been performing the Lion Dance for more than a decade. The school primarily focuses on Fu Jow Pai Kung Fu, and the Lion Dance is an integral part of Kung Fu Culture. Around 2:30 pm there will be two workshops that highlight New Year’s crafts that bring good luck and prosperity. Year of the Pig Crafts and Traditional Decorative Knots will be taught in our studios. Both are family friendly and all ages are welcome. Teacher Jane Chang will lead the Year of the Pig Craft and Demo Calligraphy Workshop. She attended master classes in Chinese Brush Painting for over 10 years with Madame Aixinjueluo Hinyi, direct royal descendent of Qing Dynasty. Teacher Ruby Chen is a master of Chinese traditional decorative knots. She also creates silk earrings and they will be available for purchase for $10.Chinese New Year is a traditional Chinese holiday that starts with the new moon on the first day of the lunar New Year and ends on the full moon fifteen days later. Each year is named for one of twelve symbolic animals: rat, ox, tiger, hare, dragon, snake, horse, ram, monkey, rooster, dog, and pig. 2019 marks the 4717th year in the Chinese calendar. Ranking as the twelfth animal in Chinese zodiac, people born in the year of the Pig are regarded as energetic and enthusiastic – they enjoy life. They are realistic and take action. If given the chance, they will take positions of power and status. In Chinese culture, pigs are the symbol of wealth. Chinese New Year Performance and Workshops, Sunday, February 10th, 1:30-3:30 pm, Pelham Art Center, 155 Fifth Ave, Pelham, NY.